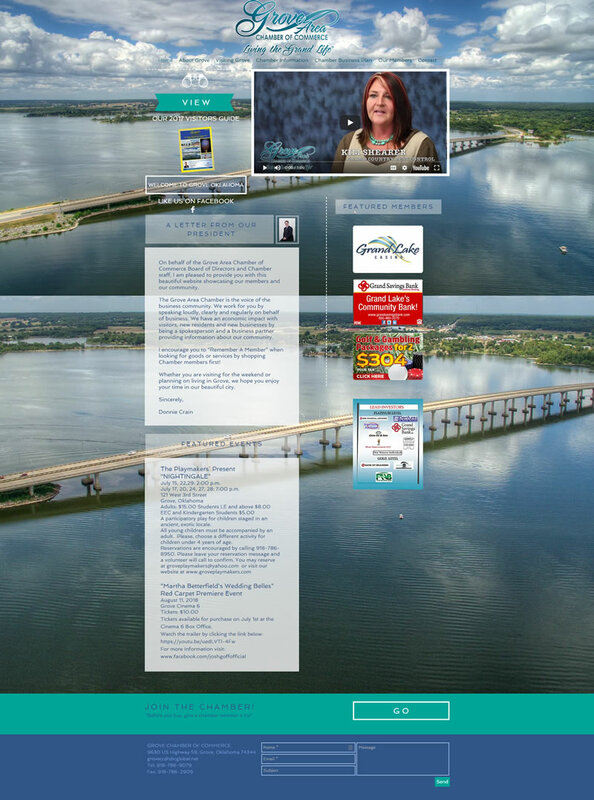 The new mobile-friendly and responsive website for the Grove Area Chamber of Commerce is bright and packed with information to help any new visitor learn more about the area. Pages are neatly organized through the top menu. More popular topics have call-to-action buttons located on the homepage. There is also a search bar to help make the search for information go faster. Throughout the website, visitors can opt-in to get more information about a certain topic by filling out a request form. We also added an Upcoming Events section with a calendar in order for the chamber to keep visitors and residents up-to-date with what’s going in the area. Thousands visit the area of Grove, Oklahoma, each year. It is the largest city on Grand Lake O’ the Cherokees. It is also the economic, housing, entertainment, and healthcare center for its eastern shores.